It’s the end of another month. And not just any month – but the end of August 2012! Tomorrow is September 1st. The month that our house will go on sale. Over the past couple of weeks, even with the cleanup and arranging, I have been enjoying the fact that we don’t have any major projects that have to be done, and taking a big sigh of satisfaction. I don’t even know that it has completely sunk in yet. After all, these projects have been going on for quite a while. They started back in July of 2008 when we had the siding and windows replaced, and we have been working on this house ever since. Four years! The days have been beautiful – nice warm days, highs in the mid 80s, and then getting down to the 60s when the sun goes down. I love this weather. Autumn actually used to be my favorite season, only in recent years I haven’t enjoyed it too much, because the coolness reminds me that winter is coming. But hopefully this is the last year I will have to spend any of the winter season up here, so I will be able to enjoy the colors and changing seasons once again. Next Wednesday we are taking the fiver to Diederich’s RV in Coxsackie. They are going to install a washer/dryer – one of the combination types. When I rented an apartment, I used to have to cart my laundry to laundromats, and I hated it. So there’s never been any question in my mind that we would have one added to our future home. And since we are down to the last few months before we hit the road, we’ve decided it’s time. The countdown to our house sale has now moved into the final stretch – NINE DAYS left. I’ve heard from the realtor, and the date and time for the pictures has been set – this Monday, September 3rd around 11 am. Our realtor is showing another home in the area that morning around 9:30, and will come over afterwards. We are ready! I think there would always be another item we could clean one more time, or a little more polish on the wood trim, but that would just be a little more spiffing up. When it comes to the bottom line, we are good to go. We’ve finished all the “fix it up” projects that we had on our list, and there’s nothing in the house that absolutely has to be done before some potential buyer walks in the house to take a look at it. My projects yesterday went well. The bedspread for the guest room is clean and replaced back on the bed. The only thing that we still need to do up here is take the extra flooring that can be seen peeking out from under the bed down to the garage. That door in the wall leads to a huge storage area that runs the length of the room. There is another area of the same size in the other upstairs bedroom. Anyone who wants a lot of storage space is going to love this house. One of the reasons I am going to be so glad when the house goes on sale is to not have to think so much about some of the “what ifs”. Both Harry and I go back and forth – is the house sale going to take a while? Could we possibly get an offer right away? At least the answer to THAT question is going to be answered soon, and I am going to be happy that I can stop wondering about that one at least! Ten days until the house goes on sale – tomorrow – SINGLE DIGITS!! That’s what’s on our agenda these days – a good cleaning and the last bit of sorting. I will probably hear about a firm time today, but as far as we know, we are getting together with our realtor on Monday for pictures and paperwork signing. Over the weekend we worked on the upstairs…washed windows, cleaned the floors, got the majority of our stuff out of the hall closet. I love the way this closet turned out. We will have these suitcases out of here before there are any people here to look at the house. The upstairs guest bedroom is empty except for the bed. The blanket on it right now is to protect it from cat hair. One of the items on my agenda for today is to go to the Laundromat and wash the bedspread that goes on this bed. Then we will close the door so it can’t get covered with fur from the "kids”. The downstairs bedroom is also empty except for the bed. We have been using the bed for our sorting area but there’s not much left here now. Just a few odds and ends. The bin on the bed is the last item that needs to be added to our basement. The dining room is looking good – we can actually see the table! Notice how dark the outside is in these pictures? I took them all this morning around 5:45 am. Our bright early mornings are gone for another year. Besides washing the bedspread, the other major item on my agenda for today is the kitchen. We are almost there. Five more days until pictures and eleven days until…well, you know what. Well, this is it. After all of the work on the house over the past years – the replaced floors, the painting of the walls and closets, the new doors and staining of the trim, we are finished. We have crossed off all those last minute items that I posted on the blog a couple weeks ago. What a great feeling and sense of relief. Yesterday Denise and Mike came over for one more look at the stuff we have left in the garage. They took a few more things – Harry’s boxes of bolts and screws etc, and some office supplies. It’s getting to be slim pickin’s out there. The plan for today is to do some cleaning. We are going to work together on each room. Clean the floor, polish up the trim, make sure all the clutter is out, clean the windows… I love the fact that we are at this point. The pictures for the house sale are scheduled for sometime next weekend. I’m waiting for an answer to an email, and then we should know which day. We are planning on being done by Friday anyway. So we have today, and the work week, to get the place in tip top picture conditon. I’m such a mix of feelings right now – excitement, satisfaction, a sense of completion. I’m still finding it hard to really believe that after all the months of counting down we are down to our last TWO WEEKS. I just can’t wait to post a picture of that FOR SALE sign. In the past three years, we have gone biking only a couple times. So to go three times in as many days was a feat, but we managed it! If we had more time here, we might have had a day of rest in between, but being our last day there was no time to waste. This time we drove to AuSable, and biked along the AuSable River through Jay into Upper Jay. It’s another nice ride, with only a few hills to go up. We used an app we downloaded called AllSport to keep track of our stats. In Upper Jay, when I was growing up, there used to be a little theme park called “Land of Make Believe”. It’s been closed for many years. That’s what this sign is referring to. There were so many beautiful views – if I had taken pictures every time I saw a great view, we would have been stopping to take pictures every mile or so. On our way home, we stopped at a local deli and bought sandwiches for lunch. We found a nice shady spot at a park in Jay and enjoyed a great lunch. We did 22 miles in all, and had another great ride. 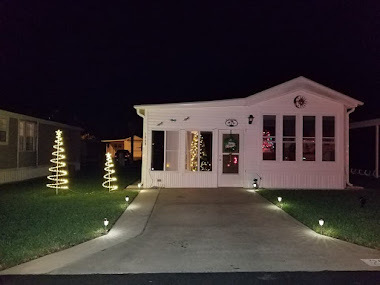 After dropping Mom off at home, we headed back to the campground to get cleaned up, and then enjoyed a second fun event on our last day – dinner with Judy and Ed. Yesterday was Ed’s big day as he is now retired!! And they will be heading out in their motorhome in just a few weeks. We had a great dinner trading places on our bucket list and sharing stories. Thanks again for dinner – we had a great time!! And unfortunately, our time here has come to an end. This morning we will be packing up and heading out for Albany. Trip #4 is now in the books. We had a leisurely start to our Tuesday…slept in (for us), getting up a little after 7. It was another beautiful day with blue sky and very few clouds. We spent some time checking out the news and forums, and I read some blogs. After a while Harry started getting our bikes together and around 11 o’clock, my mom arrived for our bike ride. Our route was in the other direction from our first trip, heading down toward Lake Champlain and Plattsburgh. It’s a great route, with some inclines but no huge hills, either up or down. Now that I’m older, I mind hills more than I used to. Don’t want to be taking any falls now, do I? There were some beautiful views of the lake as we traveled by, and an interesting memorial in Valcour. I traveled this road on a daily basis in the early 80s when I was commuting to college from my home in AuSable Forks, and never stopped to see what this memorial was all about. We found so many nice places to stop and take some pictures. This is Mom and me…she passed the 20,000 mile point on her bike a couple months ago. Here we are…second bike ride of the summer…we will probably not even hit the 100 mile point until after we hit the road. But not bad for our second ride of the season…20.75 miles! It was such a great ride. We arrived back at the campground around 3 o’clock. Tuesday dawned with a clear blue sky. After some coffee and breakfast, Harry and I embarked on our first real bike ride of the year. It was a really great bike ride. Peru has some nice flat roads, although we did encounter a few inclines. We biked past fields of corn and lots of apple orchards. The boxes in the picture are lined up along the edge of the orchard, waiting to be filled with delicious apples! The great thing about biking is being able to see details you would probably miss in a car. I have ridden on these roads hundreds of times and have never noticed this sign. We didn’t have any way of keeping track of our distance etc. So later on we went back over our route on our way over to my mother’s house, and found that we had biked 11.1 miles 0 not bad for our first ride! At my mom’s place, we looked over the changes to the backyard – that hammock was looking pretty inviting, but I resisted! We had a wonderful first full day here at Iroquois Campground. The day dawned with a beautiful blue sky, although unfortunately we woke up way too soon, at 5:30 am. It was a bit chilly too – 46 degrees when we got up – so I had to close the windows and turn on the fireplace to take the chill out. Great sleeping weather though! This is the view of our “street”. Around midday our company started arriving, my mom and stepdad, my sister and the kids, and a couple friends. We had a great afternoon, hanging out chatting and having some munchies. The kids went over to play in the field right around the corner. Harry made a small fire so the kids (big and small) could make some s’mores. We have arrived! Trip #4 of the season is underway. This morning, after getting up bright and early, we started making sure those last minute items were stowed for the trip. I had to do my usual Saturday morning work stuff, but I traded to open instead of close. I was very thankful that there were no last minute members coming in to open an account or get a loan, and happily headed out of work at 1:01! Right after I locked the doors. We are getting the hitch up process down to a science, and once I got home, things proceeded easily. We were heading down the road at 2:07. We had a little bit of a slow down for the beginning of our trip that extended our traveling time by about 25 minutes, but once we were past the construction zones in the capital district, we started moving along. It was an absolutely beautiful day for traveling. I took lots of pictures! Once we got going, the cats settled down too, and only complained occasionally that they weren’t completely happy with their situation. It did seem a little weird to me to be coming with the fiver to a place that is so familiar to me. This is our first trip up north. Although this is our longest trip so far this season – we are staying until Thursday – it will probably be one of our quickest too, as we have a lot planned for these few days. The weather has taken such a nice turn, and tonight we are hanging out with all our windows open and no fans running. For the next week plus, our forecast looks to be highs in the mid 70s and lows in the mid 50s. We are so excited to see the gorgeous days coming up for our next trip. I still have to work one and a half more days, but as of Saturday afternoon we will be heading north to Peru, NY for a stay at Iroquois Campground. The picture on the right was taken in Peru when we were up visiting my mother in October ‘10, and all of the pictures in this post are from that trip. Peru has a lot of roads that are great for biking, and I am looking forward to being able to use our bikes a bit more on this trip. We may also have to take a trip over to this orchard and pick up a pie, or maybe some apple cider donuts. It is right down the road from the campground. We are really looking forward to taking a break from working on the house, and being able to spend some time hanging out with family. We are also going to meet up with some fellow rv’ing bloggers. So lots to look forward to!! When we come back, we will have one week left before pictures, and I think we will probably spend most of that week CLEANING.